Please note the studio is closed between 15 to 22 April. 23 April 9:30 am MORNING Class is ON. 23 April 6:00 pm EVENING Class is Canceled. ANZAC Day: 25 April 9:30 am MORNING Class is Canceled. ANZAC Day: 25 April 6:00 pm EVENING Class is ON. Restorative Yoga & iRest - a winning combination and highly recommend for beginners and all for Peace & Healing of body & mind, stress reduction, and general wellbeing. Gerlinde is a very caring yoga teacher. You feel restored, renewed and centred by attending this special class for all ages. Perfect for beginners, or even advanced practitioners wishing to slow down and deepen Awareness. This class will incorporate gentle Somatic movements with soft openings and mind-body awareness into a slow, meditative, calm Hatha Yoga practice. Perfect for beginners and even advanced practitioners. Emphasizes mindfulness and awareness of movement from within. Suitable for intermediate and advanced students. Emphasize mindfulness and awareness of movement from within. Deepen your practice as well as your connection to all aspects of your Being. This class will incorporate gentle yoga & somatic movements with soft openings and mind-body awareness into a slow, meditative, calm Hatha Yoga practice. Gentle Yoga 45 min & iRest 45 min - a winning combination and highly recommend for beginners and advanced for stilling body & mind, and general wellbeing. Sensing body through gentle yoga for deeply releasing tension and renew with long restorative iRest. Please arrive a little early and be ready on your mat to start the class on time. 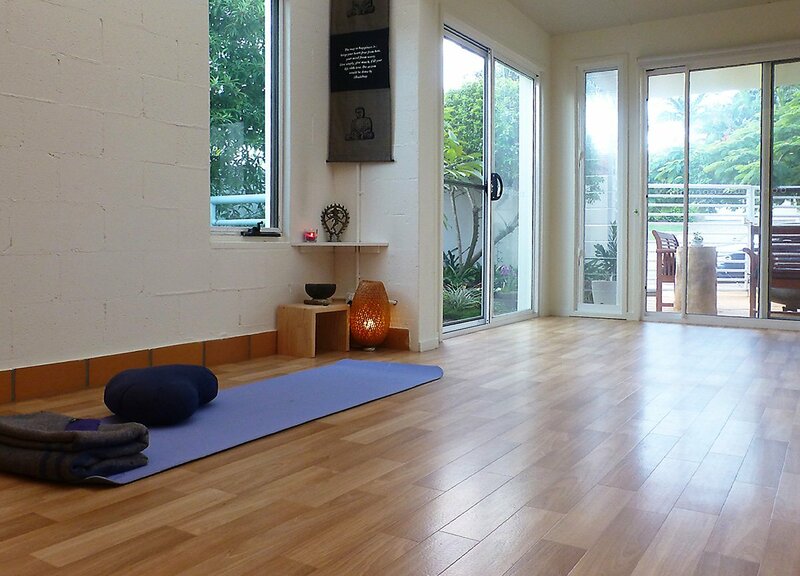 Private one on one session, Yoga or Meditation Corporate Lessons and Private Group Lessons are available.